I am writing here today because I do not know what else to do or who to reach out to. It is hard for me to believe I am in this position. Watching helplessly as everything I have worked for, my entire identity as an artist, slips through my fingers. But I refuse to go quietly. I will not stand idly by and watch myself become a disambiguation. 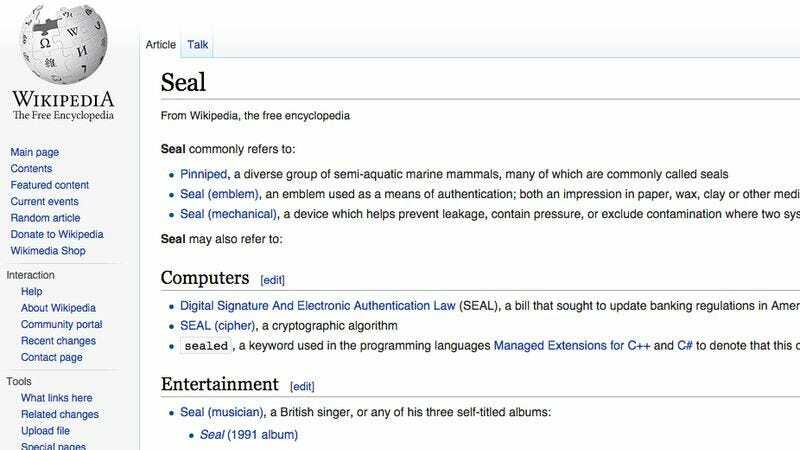 Right now, when you type “Seal” into Wikipedia, I am not the first result. I am not the second result. I am not even the third result. I am the seventh result. Yes, this was surprising to me too when I first saw it. Of course, while I am aware of the other seals, I never thought the day would come when I would be forced to compete with an aquatic mammal for cultural relevance, much less be forced to watch my whole career, my whole existence, be last in line to emblems, computer algorithms, and even banking regulations bills. How can this be? Considering the many things I have contributed to the world—“Crazy,” “Kiss From A Rose,” my “Fly Like An Eagle” cover—how is it possible that Wikipedia groups me with the likes of the Navy Seals and the emblem kind of seal? It makes no sense. Mark my words: I won’t stand to be treated like just some other seal. Just ask yourself: How many Seals had their song featured in the credits of Batman Forever? How many Seals were married to Heidi Klum and are the father to four of her children? How many Seals have had mainstream chart-topping hits in both the U.K. and America? Only one Seal can say that. The one that matters. “Kiss From A Rose” was a No. 1 hit. Search for it on Wikipedia, and it takes you straight to its own page. Sadly, the same cannot be said for the name of the artist who wrote that song. I refuse to go the way of Flea and Ice Cube. Great artists rendered unsearchable by virtue of their names’ alternate associations. Maybe we could solve this whole problem if we just made the searches case-sensitive. Regardless, it is an issue that affects dozens of artists. When I chose the stage name Seal, I could not have known the adversity I would one day face because of it. My entire career, people have been able to easily distinguish between me and the various other seals. But the internet has changed that. It has mistakenly labeled me the other seal. The lesser seal. The disambiguation. Well, it ends today. The people deserve to be directed to the Seal they actually wanted to read the Wikipedia article about. The Grammy Award-winning recording artist Seal. The REAL Seal.